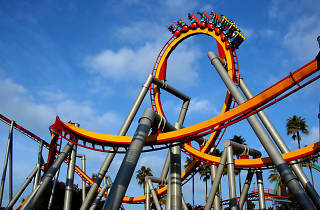 Photograph: Courtesy Knott's Berry Farm Silver Bullet at Knott's Berry Farm. Knott's Berry Farm started as a farm selling the homemade preserves of one Mrs. Cordelia Knott. Although Ma Knott and her family are long gone, her jams are still on sale. But on the whole, the folks at Knott's Berry Farm have realized that it can't get by on nostalgia alone: there seems to have been a concerted effort of late among the park managers to haul this formerly old-fashioned enterprise into the 21st century. Parts of Knott's Berry Farm aim to portray an idealized, kinder America than you might find at, for example, Universal Studios. Some charming remnants of the park's early years remain: most notably in the Ghost Town section, which contains a number of buildings that have been transplanted from old mining towns. The continued presence of Snoopy as the park's mascot is another gentle nod to tradition. Ultimately, though, the thrill-seekers win out over the sentimentalists thanks to a number of water rides, the stomach-churning Xcelerator and Montezooma's Revenge attractions, and two new rollercoasters: the Sierra Sidewinder and the Pony Express. Next door to the Berry Farm sits Soak City, a mammoth water park that's open only during the summer months. Combination tickets are available for the two attractions; check online for details. My first visit to Knott's was pretty underwhelming. The old mine and log flume rides are charming and sometimes legitimately cool, though mostly hokey. None of the coasters really jumped out at me, though Xcelerator and Silver Bullet are fun. If you're going to pick one park, you're definitely better off with Disneyland for all-around magic and fun, Six Flags for thrills and Universal for... Harry Potter. Knott's has pricing going for it, but you kind of get what you pay for. 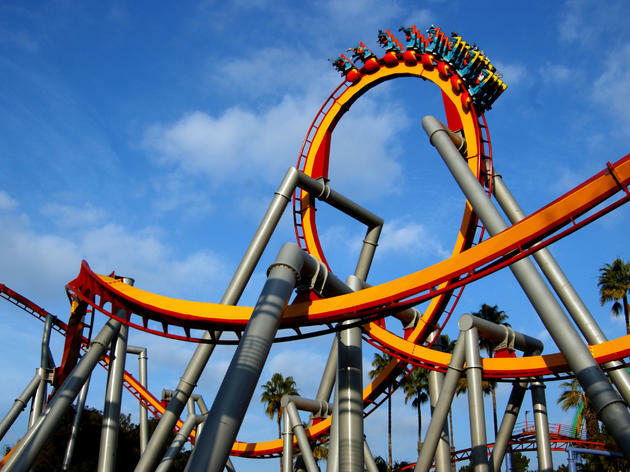 Knott's Berry Farm might be the red-headed stepchild when it comes to theme parks in Southern California but it has a lot to offer - fun roller coasters, yummy fried chicken, shorter lines and, of course, Knott's Scary Farm during Halloween, which is pretty hard to beat. It's not as expensive as some of the other parks but still packs a whole lotta fun! When Disneyland and Six Flags are in the general vicinity, it's hard to make a case for Knott's Berry Farm. It's smaller, and a bit hokey. But if you're into winding, fast roller coasters, it's a fun amusement park to spend the day. My favorite ride is the Boomerang, which takes you on a couple loops—and then goes backwards. Not for the faint of heart, especially if you've had a bunch of funnel cake beforehand.